This is a Must-See Animutation, considered to be a good representative of the genre of Animutation. This article is incomplete: it has a structure in place, and is beyond stubness, but some parts in particular are marked as needing completion. You can help the FanimutationWiki by expanding it. 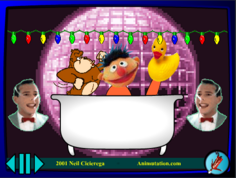 Join Ernie as he goes on a magical journey on his first rave. From the superhero feelings of elation to the plain oddities of drug-induced fantasies, this one won't disappoint. This is an early work of Neil's. This movie is the most obvious drug-themed Animutations. From the number of bloodshot eyes, to Ernie soaring through the universe and appearing over the bodies of various superheros, the theme oddly is a perfect fit for the chosen music. eine Badewanne voll Wasser, voller Schaum und ich mittendrin. Ein Stück Seife und ein Waschlappen und dann runter mit dem Dreck. was die Badewanne zum schönsten Platz auf der ganzen Welt macht. Könnt ihr euch denken, was es ist? Quietsche-Entchen, ich hab dich so furchtbar lieb. Quietsche-Entchen, der beste Freund, den's gibt. Das ist ein sehr sehr guter Freund von mir. Wohl das Verrückteste, was man jemals gehört hat. Ja, das klingt schon sehr gut, wirklich. Los geht's Bert, eins zwei! Pause the movie whenever the smiling guy with the red Alvin shirt (The one with the letter "A" on it) appears. Note the suspect material he has in one of his hands. This movie has three hidden moments where the frames urge you to buy Funyuns. Total time message is shown: one frame. First: A little bit after Mr. T and Jackie Chan appear, as Bert floats at you. Second, almost 3/4th through, as it switches between Ernie and Micheal rapidly. Lastly, right before the end, before Jackson appears, in the upper-left corner. The creator noted that Ernie's laugh sounded oddly like a machine-gun, hence the reasoning for Bert gunning down Ernie several times. Progress Indicator Ornament: Grinning guy with red Alvin shirt. "Michael Jackson" is the mondegreen of the line "Mein Quietsche-Entchen" which is German for "My rubber duckie"
When Bert appears after the rapidly alternating Michael Jackson and Jackie Chan, a tiny message appears under Bert's mouth reading "Bert is just misunderstood". When the three Ozzy Osbournes dance in the tub, tiny text reading "BATHTUB" is visible in the top-left corner of the bathtub. There is hidden text in the bottom part of the frame, to the left of the "Animutation.com" text, that says "Spaz ate the Dopefish". At the end of the movie, there is tiny text on Michael Jackson's nose reading "What prompted this sudden interest in Micheal [sic] Jackson's nose?" This page was last modified on 29 August 2016, at 09:34.